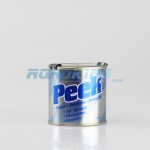 We stock a range of Peek metal polish, liquid & paste. It is a very popular high quality polish, ideal for protecting and cleaning all surfaces. Peek polish even bring back to life badly tarnished and oxidized metal items. Surfaces are left bright and beautiful with the polish leaving behind a light, invisible protective coating. 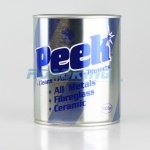 Peek polish is an advanced and extremely effective polish that can be used most metals and other materials including brass, silver, copper, gold, chrome, stainless steel, bronze, pewter, fibreglass, plexiglass, acrylic, aluminium (Peek polish is not suitable for anodised metals), ceramic tiles, marble, melamine, formica, arbonite and sterling silver. We offer the product in 100ml, 250ml and 1000ml containers making Peek Polish the perfect cleaner for whatever size cleaning task you have.